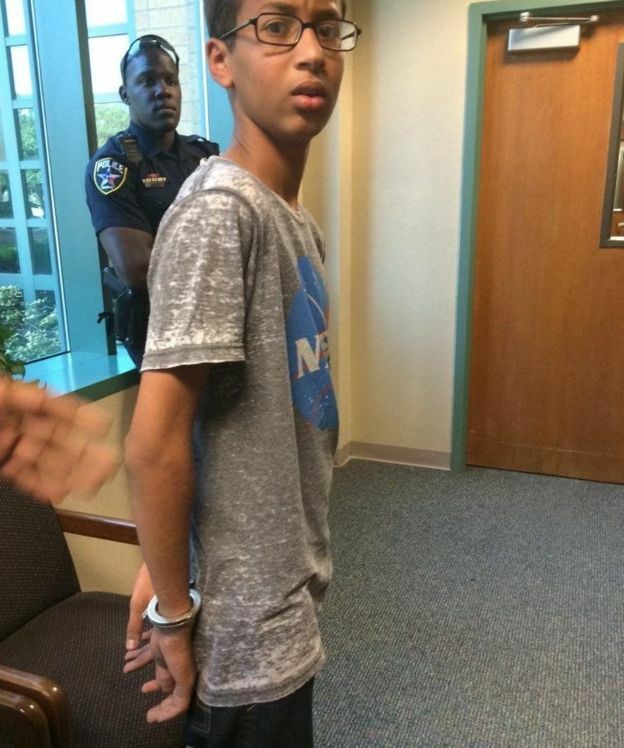 A 14-year-old Muslim teenager Ahmed Mohammad was arrested in Texas when he showed his teacher a clock he had built at home. The teacher mistook the student's invention for a bomb and called in the police who handcuffed the Sudanese-American teen and escorted him down the hallway, out the school building and to a juvenile detention center. The incident was highlighted by the Council on American Islamic Relations, a American Muslim Civil Rights group, as another egregious manifestation of anti-Muslim bigotry that prevails in many parts of the United States. There has been significant outpouring of support for Ahmed since the incident came to light. President Barack Obama invited Ahmed to the White House via a tweet that said: "Cool clock, Ahmed. Want to bring it to the White House? We should inspire more kids like you to like science. It's what makes America great". It was followed by a tweet from Democratic presidential candidate Hillary Rodham Clinton that said: "Assumptions and fear don't keep us safe—they hold us back. Ahmed, stay curious and keep building. Many top Silicon Valley technology executives also took to the social media to support Ahmed. Facebook CEO Mark Zuckerberg weighed in, inviting the Texas teen to visit the tech giant's Menlo Park campus. Google invited Mohamed to its annual youth science fair in Mountain View this weekend. And Box CEO Aaron Levie also extended an invitation. Twitter has also extended an invitation to Mohammad to visit its office in San Francisco. Popular twitter hashtag #IStandWithAhmed in support of Ahmed Mohamad has been trending for several days now. Some elite US schools, including Harvard and MIT, have invited Ahmed Mohamad to visit their campuses. Would this story have found much traction without the social media? I doubt it. It was the growing power of the new media that led to the teen's release from custody on Wednesday after 2 days of detention. During this time, he was elevated to the status of an American folk hero. As we celebrate the meteoric rise of Ahmed Mohammad to celebrity status, we must not forget the long history of bigotry and violence against natives and minorities in this country. Even President Obama has been a frequent target of racists. Republican Presidential Candidate Donald Trump's vicious attacks on Mexican immigrants and his rapid rise in the national polls is an indication that racial and religious bigotry remain alive and well in the United States. We must support organizations such as CAIR and ACLU that stand against this tide to assure implementation of the Bill of Rights for all Americans, including women and minorities. We must also make use of social media to highlight social problems that are spun or left uncovered by the mainstream commercial media. Saudi Prince Funding Hate Against Muslims in America? He showed it to his science teacher first, which was okay, then took it to the English class and set up a timer to go off in the middle of it, which was not okay. Why do you suppose he did that, and what were the teachers supposed to do with his actions? Ali: "He showed it to his science teacher first, which was okay, then took it to the English class and set up a timer to go off in the middle of it, which was not okay. Why do you suppose he did that, and what were the teachers supposed to do with his actions?" Are you suggesting it's an arrest-able offense? Would he have been handcuffed and sent to jail if his name was not Ahmed Mohamad? You might thank ISIS for that as they have repeatedly told that lone wolfs would bring terror in USA. Just like muslims love to say that violent and abhorrent verses of word of god aka Quran has a context, this too has a context. "Would he have been handcuffed and sent to jail if his name was not Ahmed Mohamad?" "Police reacted to the possibility of a bomb threat by arresting the 14-year-old. They took the handcuffed youth to juvenile detention. However, the boy’s reaction to police questioning may not have helped to clear his name sooner. Officers described Mohamed as “passive aggressive” in his responses to their questions and did not have a “reasonable answer” to explain the situation while investigators said the student told them it was just a clock he was tinkering with as a project, according to the Dallas Morning News." Your comments are a clear giveaway that you are both Hindu Nationalists who are just as hatful as the Islamophobes in Texas. You'd probably a different view if you faced a similar situation that has been faced by brown-skin Hindus and turban-wearing Sikhs in America. "In middle school, I was physically grabbed by a security guard and dragged across the lunch room," Talia, a 20-year-old Muslim college student from Queens, New York, told Mic. Not knowing which door to use, Talia (who did not disclose her last name because of her undocumented status) entered her middle school cafeteria through the wrong door for the second time. "He just grabbed me, dragged me across the lunchroom and took me to the other side. Nobody said anything," she said. Talia never reported the incident, to avoid interaction with authorities. "You're supposed to do what authority tells you to do and as an undocumented person, I've always been taught to stay safe, put your head down, go to school and don't push back or anything," she said. Talia is not alone. According to a 2006 report from Desis Rising Up and Moving, 26% of South Asian students are afraid to give any kind of personal information to authorities and among South Asian non-U.S. citizens, the number is 34%. The report, "Education Not Deportation," details South Asian students' experiences in New York City schools. Talia is a youth leader at DRUM, a community-based organization that organizes working-class South Asian adults and youth around issues of racial and educational justice in Jackson Heights, a neighborhood in Queens. Rishi Singh, educational justice organizer at DRUM, told Mic that Talia's stories reflect an increasing tension in New York City's public schools — and nationwide — since the adoption of controversial zero-tolerance policies. "I think all students, particularly students of color, they don't feel like their school is a school, they feel like it's a jail," he told Mic. "They feel they've done something wrong every time they go through scanning in the morning." Many New York City school students, including the Muslim students who spoke to Mic, must pass through a metal detector every day, which the New York Civil Liberties Union called "a potential flashpoint of confrontation between [school safety officers] and students," in a 2013 report on the school-to-prison pipeline. "Every time I would walk through, I would get wanded," Talia said. Over time, she knew to point out to security guards where the metal pins were under her hijab, though that wasn't always sufficient. She was once asked to go to the bathroom to have her hijab inspected. The only female police officer available to search her was a sergeant carrying a gun. "I was like, 'I'm not taking off my hijab, I'm not doing it,'" she said. They ended up giving her a rougher-than-usual inspection. "They were feeling my hijab, grabbing my hijab and my hair. I refused to go to the bathroom with the sergeant." DRUM's 2006 report found that 85% of South Asian students surveyed reported harassment by school or police authorities. Thirty-one percent said their harassment was due to actual or perceived race or ethnicity, while 29% felt it was due to actual or perceived religion and 17% felt the harassment was because of their immigration status. For Singh and other DRUM leaders, this means that school's approach to justice must be reframed as restorative, rather than punitive, meaning infractions would not pile up and push students out of school. Singh hopes that schools can embrace a model where parties involved in confrontation can confront each other to find common ground. It was gut wrenching to watch the photo of the innocent kid handcuffed, and without a doubt would not have happened if he was not a Muslim. Islamophobia in the US is real, and only has increased drastically since 9/11 & for rightfully so. It is only human tendency to err on the side of caution, than getting blown up, and this incident is an unfortunate side effect of the mindset. But how can you change the mindset of the populace? It can only happen if the Muslims in the US can show unity and portray themselves (consistently in action- not just words/rallies) fact that US comes first, then being a Muslim. But even if the majority are true patriots, there are enough bad apples to rot the entire lot. sundar: "But even if the majority are true patriots, there are enough bad apples to rot the entire lot." 1. Should all white people be suspected as mass shooters until all mass shootings stop? 2. Should all blacks be considered criminal suspects until all blacks stop committing crimes? 3. Should all Hindus be considered Muslim mass killers until all Muslim killings stop in India? 4. How far will you take such stereotyping? I am not stereotyping. I am referring to the stereotyping done by the general public against Muslims here in the US, and how you can play a part in alleviating. Simply stating "stop stereotyping" without follow up in action is not going to solve the problem. Stereotyping in an intrinsic form of human behavior, and usually there is some truth behind it. >>> 1. Should all white people be suspected as mass shooters until all mass shootings stop? Whites form 70% of the population of the US. For the population, whites involved in mass murder is abysmal. Abysmal enough from being stereotyped. >>>> 2. Should all blacks be considered criminal suspects until all blacks stop committing crimes? Sad to say, black commit crimes disproportionate to their population ratio. Bet, you will not dare venturing in to parts of Oakland & Richmond at night. >>>> 3. Should all Hindus be considered Muslim mass killers until all Muslim killings stop in India? Totally irrelevant to this discussion. >>>> 4. How far will you take such stereotyping? Again I am not stereotyping. I am pointing out the cause of being stereotyped by others. sundar: "Again I am not stereotyping. I am pointing out the cause of being stereotyped by others." Blaming the victims is the oldest trick in history. sundar: " some have said that being a Muslim comes before anything, even being an US citizen. That's were the problem starts ...."
And you don't that's true of many Americans? Have you heard about Kentucky county clerk Kim Davis who claims to answer to a higher Divine law than the US Constitution? Who is blaming the victim? The victim has got itself an appointment with the president. Saying "Blaming the victims is the oldest trick in history" is perhaps the oldest trick to avoid tackling the problem, and passing the blame on others. I am not cordoning Kim Davis behavior. She got punished for it (just like the Muslim Air hostess who failed to serve alcohol in flight). I rest from this discussion. sundar: "The victim has got itself an appointment with the president." Ahmed is just one of many victims. Most get little media coverage. sundar: " She got punished for it "
Kim Davis also became a conservative Republicans hero in the process with millions supporting her actions, including several presidential candidates. A Syed said it, so got to be true, right? Aren't Syed suppose to be direct descendants of Prophet Mo. And Riaz sahib will always allow such comments to be posted, while blocking almost all comments from Hindus. Appreciate it. BTW today RAW did it again. Syed, In the many years I have been in the US, I have never felt any need to be Racist towards any Muslim or for that fact, against anyone; and I have many Muslim friends here from India & Pakistan. So keep your racist rant to yourself. These useless racist rant is plain counter productive. SQA: "I find more racism in Hindus then the white folks I have met for the last 35 years in USA "
1. 43.5% of Indians, the highest percentage in the world, say they do not want to have a neighbor of a different race, according to a Washington Post report based on World's Values Survey. This compares with under 5% of Americans and less than 10% of Pakistanis reported by the survey. What happened to this kid was unfortunate and is rightly being condemned. At the same time, secular, tolerant, democratic and rule based societies have self correcting mechanisms like what is shown here. In a country like Saudi, he will be simply called "Abid" (slave) in the classroom and not a whimper from anyone! The Islamofascists would try to take advantage of such abominations to weaken the host societies and take away their ability to defend themselves. Like what happened in the Abu Nidal case where despite his obvious terror tendencies, no one had the guts to kick him out to avoid being called Islamofascists. Unless these Islamists look honestly at the bigotry going on in their own societies, their pathetic whining doesn't impress anyone. Rajesh: "In a country like Saudi, he will be simply called "Abid" (slave) in the classroom and not a whimper from anyone!" That's the reason Saudi Arabia and other developing nations like it, including India, are so under-developed and backward. Western societies like the United States that encourage free thought and embrace diversity encourage innovation and creativity and greatly benefit from it. Saudi is a rich country. Though it is unearned money. The issue is that no Islamic countries are secular and Muslims want theocracy when in majority. Across the board. The minorities are just wiped out like what Pakistan did before turning on the non dominant sects like Shia/Ahmedi etc. The ethnic cleansing was overseen by Mr. Jinnah himself right at the time of partition. India on the other hand chose to be secular and democratic, the only beacon of light in a vast, dark area for a thousand miles or more. One just has to open the eyes and look at the facts, something not encouraged in Pakistan. Anyway it is not about India. Muslims need to first practice in their own countries what they demand from non Muslims. Till then it is only munafiqat and everyone sees through it. Rajesh: " Muslims want theocracy when in majority. Across the board." Nothing could be further from the truth. Of the 50 Muslim majority countries in the world today, only one (Iran) is a theocracy. Most non-Arab Muslim nations are democracies and doing better economically, educationally and socially than Hindu-dominated India. Rajesh: "he minorities are just wiped out like what Pakistan"
Pakistan's Hindu population is the fastest growing in the world..growing even faster than the Muslim population. Rajesh: " India on the other hand chose to be secular and democratic, the only beacon of light in a vast, dark area for a thousand miles or more." Rajesh: " Till then it is only munafiqat and everyone sees through it." There's no bigger "munafiqat" than proclaiming to be secular while pushing Hindutva as Modi and his fellow extremists are doing in India. the counter-extremism policies that Obama supports seem to encourage such severe responses to normal behavior in Muslim youth. While it’s easy to dispel Ahmed’s case and what happened in Irving as an aberration, fear and demonization of American Muslims is the norm. At a White House summit in February, Obama championed the Department of Homeland Security’s “countering violent extremism” program, which calls on teachers, faith leaders and neighbors to suss out early indicators of extremism and report them to law enforcement. This federal initiative, which largely targets Muslim communities, was piloted in Los Angeles, Minneapolis and Boston, and it is now proliferating across the country. What kinds of behaviors are we talking about? For the most part, they’re not related directly to plotting attacks. They’re more subtle. For instance, parents might see sudden personality changes in their children at home — becoming confrontational. Religious leaders might notice unexpected clashes over ideological differences. Teachers might hear a student expressing an interest in traveling to a conflict zone overseas. Or friends might notice a new interest in watching or sharing violent material. This guidance encourages a hypersensitivity to the mundane behavior of young American Muslims and demonizes acts that are protected by the First Amendment. Innocuous activities like growing a beard, attending a fiery sermon, protesting U.S. foreign policy or fraternizing with Muslim political groups become “warning signs” that are reported to police under the guise of countering violent extremism. "I said: it's sad they thought that kid had a bomb. She said: they didn't think he had a bomb. She said: They just wanted to humiliate a little Muslim, African boy. They didn't think he had a bomb. I said: Don't be a conspiracist. They might be a little prejudiced, but I'm sure they thought he had a bomb. But they didn't evacuate the school, like you do when there's a bomb. They didn't get as far away from him as possible - like you do when there's a bomb. Then they waited with him for the police to arrive. Then they put the clock in the same car as the police. They never thought he had a bomb"